In stock -This product will ship today if ordered within the next 14 hours and 56 minutes. 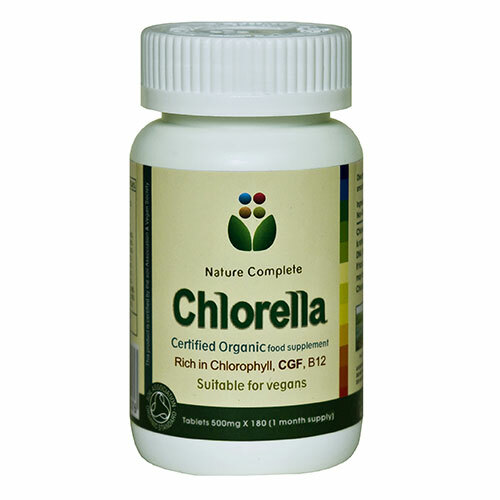 Chlorella is a green single-celled freshwater alga. Chlorella is the nature’s richest plant source of chlorophyll, DNA, RNA and contains essential vitamins. It has a unique Chlorella Growth Factor (CGF), which may support tissue generation. Chlorophyll is thought to help detoxify our bodies. Nature Complete Chlorella is organically grown without the use of conventional pesticides, fertilisers or sewage sludge and is processed without ionizing radiation, no binders, fillers or any additives. Organic produce is simply healthier, richer in nutrients and tastes so much better. Going organic is the safest way to avoid eating genetically modified (GM) food. Nature Complete ensures that the Chlorella cell walls have been highly broken down to ensure all nutrients are readily available to our bodies. Nature Complete Chlorella was the first that the Soil Association ever certified. The entire Nature Complete range is registered with the Vegan Society and produced at a certified manufacturer that meets the standards of Good Manufacturing Practice (GMP), International Organization for Standardization 9001:2000, Halal Product, Star-K Kosher, and Quality System. Nature Complete Chlorella is suitable for everyone, including children, vegans, pregnant and nursing mothers. Nature Complete Spirulina is organically grown without the use of conventional pesticides, fertilisers or sewage sludge and is processed without ionising radiation or any additives. Take 6 tablets daily, taken all at once or 2 - 3 times throughout the day. Caution: Chlorella contains Vitamin K. Consult your GP if you are using blood-thinning medications such as warfarin prior to taking this product. this product is organically grown on a island in the south china sea and is produced under Naturland organic standards. Below are reviews of Nature Complete Organic Chlorella - 180 Tablets by bodykind customers. If you have tried this product we'd love to hear what you think so please leave a review. 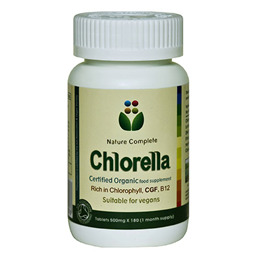 Chlorella is a green single-celled freshwater alga. It is the natures richest plant source of chlorophyll, DNA, RNA and contains essential vitamins. Nature Complete is the only brand of Organic Chlorella that is certified by the Soil Association.